How Safe Is Plastic in a Microwave? We live in a world filled with chemicals. They're in our water, our air, our soil -- and, as a result, they're in our bodies. Some of the most worrisome chemicals in everyday use are in plastic, the ubiquitous material that makes up so much of modern life. How do we expose ourselves to the chemicals in plastic, and how safe are they? As if to add to the anxiety, some experts fear that when we heat food in plastic in a microwave, we significantly increase our exposure to potentially harmful compounds in some plastics. Is it safe to microwave plastic? There is no single plastic: The term describes everything from polyvinyl chloride (the compound in familiar white PVC pipes) to acrylic paints to the Bakelite once used to make tableware. Plastics can be made of organic or inorganic chemical compounds. The toxicity of any particular plastic is a function of what's in it, and how stable it is. Since most plastics are water-insoluble, they're fairly stable and chemically inert. Two additives, however, stand out among toxicologists as potential human health hazards: bisphenol-A, or BPA, and phthalates. BPA is an additive used to make hard, clear plastics (such as CDs and water bottles). Phthalates, on the other hand, are used in plastics to make them soft and pliable (think rubber duckies). Both BPA and phthalates are believed by many scientists to be endocrine disruptors, sometimes called hormone disruptors. The hormone that BPA and phthalates are usually suspected of disrupting is estrogen. It's been linked to obesity in some research. And male fetuses exposed to high levels of estrogen may develop with birth defects including hypoplasia (a displaced urethra). One report even found that when mothers have high levels of prenatal phthalates in their system, "their sons are less likely to play with male-typical toys and games, such as trucks and play fighting," according to ScienceDaily. Though BPA and phthalates are found everywhere--BPA is even in many cash register receipts--most human exposure is thought to occur through food. Both plastic additives are in food containers, some plastic wraps and in the linings of food and drink cans. But how dangerous are these plastics in everyday use? Not everyone agrees on this matter. Because most plastics are designed to be stable, it's not likely that every contact with food or drink results in a significant ingestion of BPA or phthalates. When Good Housekeeping tested dozens of foods for plastic additives, it found that almost none of them contained plastics additives, even after microwave heating. 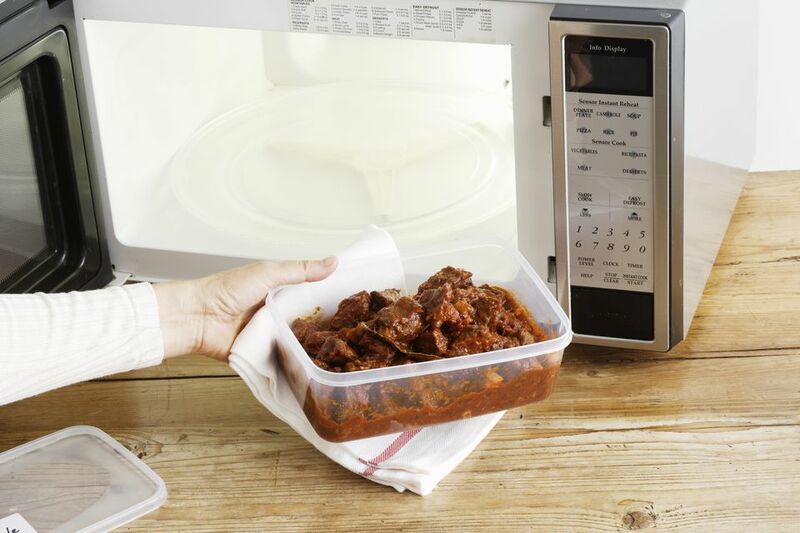 "Generally speaking, any food that you buy in a plastic container with directions to put it in the microwave has been tested and approved for safe use," George Pauli, associate director of Science and Policy at the FDA's Center for Food and Safety and Applied Nutrition, told WebMD. Perhaps predictably, the American Plastics Council website claims, "Bisphenol A is one of the most extensively tested materials in use today. The weight of scientific evidence clearly supports the safety of BPA and provides strong reassurance that there is no basis for human health concerns from exposure to BPA." According to Rolf Halden, the director for the Center for Environmental Security at the Biodesign Institute at Arizona State University, the amounts of BPA and phthalates leaching into food depends on the type of plastic that's put in the microwave, the amount of time it's heated and the condition of the container. Old, battered plastic containers and those that are heated for longer periods of time pose the greatest risks, Halden told the Wall Street Journal. Halden also noted that fatty foods heavy in cream and butter shouldn't be heated in plastic containers. "Fatty foods absorb more of these harmful chemicals when heated," he said. The first and best way to avoid phthalates and BPA is to use food containers that don't contain these compounds: Glass, metal and other containers are longer-lasting and, in the case of glass, can usually be microwaved. Some people, including research scientists, avoid contact with cash register receipts since some of these are made with thermal printing techniques and contain surprisingly high levels of BPA. Though there's probably no need for most people to go to extremes to avoid all plastics, it may be prudent for some populations, especially young children and women of child-bearing age. Because the effects of hormone-disrupting chemicals are most pronounced on developing fetuses and very young children, it's common sense to do what we can to protect these vulnerable individuals from the potentially harmful effects of plastics.